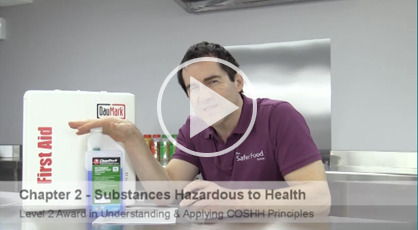 The Safer Food Group’s accredited Level 2 course presents the principles of Control of Substances Hazardous to health (COSHH) and how to apply them within your business environment. This new, flexible online video-based course filmed on-location covers the latest COSHH regulations, applicable in 2017. Fully accredited by QUALIFI, an OFQUAL regulated UK Awarding Organisation, this course highlights legal requirements to protect workers from hazardous substances, identifies hazardous substances and associated health and safety issues and outlines the risk assessment and reduction process. 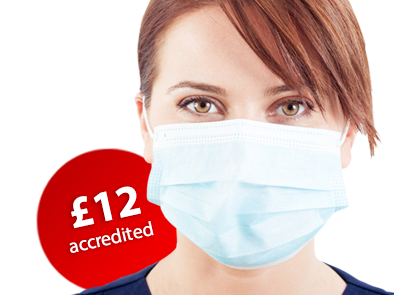 This accredited course follows the nationally recognised level 2 syllabus for COSHH principles approved by Health & Safety Executive (HSE). Identify a range of substances commonly found in a range of workplaces and the ways in which they can be hazardous to health. Describe the range and purpose of legal requirements relating to COSHH, demonstrating that they understand the various and varying responsibilities of employer, manager and employee. Show awareness of the types of injury and ill health that can be caused by hazardous substance, and an understanding of the difference between acute and chronic injuries and conditions. Identify the different ways that hazardous substances can be identified and understand the importance of good record keeping and signposting. Be able to identify the risks associated with hazardous substances and act accordingly. The value and purpose of conducting formal and informal COSHH assessments and implementing appropriate control measures. The QUALIFI Level 2 Award in understanding and applying COSHH Principles is aimed at individuals/staff who come into contact with common hazardous substances as part of their work role or within their workplace. This includes physical, chemical and biological, and waste hazards. So, it would benefit any worker, manager and employer who needs to gain an understanding of the principles of COSHH in order to operate safely. This is the most common call we get. Delivering training face-to-face involves a lot of costs (the trainer, premises, Head Office, certification fee etc). Delivering the same course online is radically cheaper as we don’t have the trainer cost, and we can spread our development costs across a large number of learners, meaning everyone pays less. We chose the charge £12 as the fairest price to reflect this reduced cost. Others have not and you can draw your own conclusions on this. What’s important is that ours follows an identical syllabus and certification process, and it’s same multi choice test etc and qualification. We’ve figured out how to do this at minimal cost and have simply chosen to pass all the savings onto you. There are two options; buy a single course for yourself or set up a business account. Option 1 Buy and pay online via Worldpay. This gets you immediate access. This allows you to use any debit/credit card and is recommended for buying a single course places. You will get immediate access following payment. Option 2 Take advantage of our bundle offers which reduce the cost of training still further (equivalent of just £10.50/person). Simply choose more than one unit in the purchase area and you will be able to set up a business account that will allow you to track your learners, course codes, gain all vat receipts, download staff certificates and much more. If you register and pay for a course yourself you will have 30 days access to complete the course training material and the test (most complete within 1-2 days). If you buy multiple courses or a bundle for you and your staff the 30 days only start when each member of staff register a course code, this way you can buy as many course codes as you like and use them as and when you need to. On gaining a pass in the exam the course access will then end leaving you with the ability to download your pass certificate anytime you like by simply logging back in. We want you to be as flexible as possible with your training requirements. This course was written in 2017, and all legislation contained within the course was accurate at that time. We recommend that you use the HSE website (http://www.hse.gov.uk/coshh/index.htm) to keep up to date with any changes in legislation, and you also renew your COSHH training every three years. What certificate do I get? You will receive a PDF certificate that you can print. Many other training companies from the food industry and beyond now use online ‘print-yourself’ certification. This is entirely legitimate, in accordance with the official qualification guidelines and accepted by your EHO. We are happy to speak to any EHO on this matter and they can contact us on 0800 612 6784. By printing the certificate yourself we are able to reduce the cost to you further. In the same way you clear your own tray at self-service restaurants (eg IKEA cafe), by this little DIY input from you reduces the cost to you the consumer.